(Nanowerk News) Calcium carbonate is found nearly everywhere, in sidewalk cement, wall paint, antacid tablets and deep underground. Engineers at Washington University in St. Louis have used a unique set of state-of-the-art imaging techniques to discover how calcium carbonate nanoparticles nucleate, which is important for those manufacturing the carbonate nanomaterials and controlling metal carbonation during CO2 sequestration. Young-Shin Jun, professor of energy, environmental & chemical engineering in the School of Engineering & Applied Science, and Quingun Li, a former doctoral student in her lab, are the first to measure the activation energy and kinetic factors of calcium carbonate’s nucleation, both key to predicting and controlling the process. Nucleation is the initial step in forming a solid phase in a fluid system, such as sugar crystals forming on string to make rock candy. Results of the research are published in Communications Chemistry ("The Apparent Activation Energy and Pre-Exponential Kinetic Factor for Heterogeneous Calcium Carbonate Nucleation on Quartz"). 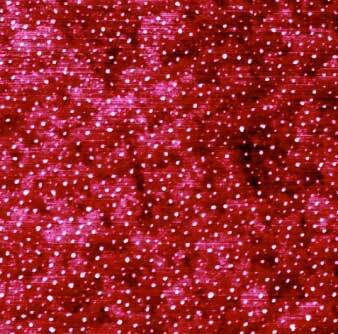 An atomic force microscopy image of nucleated calcium carbonate nanoparticles (showing as white color dots) on a quartz surface. The scan size of the image is 1.3 x 1.3 µm2. Jun, an expert in the nucleation of solids, and her team explored ways to govern the speed and location of nucleation, as well as the shape of the emerging solids. Previously, when scientists described nucleation, they described the number of events occurring in a cubic or square meter every minute or every hour, but that did not give a full picture of the chemistry, Jun explained. With the new information, Jun and her team can say definitively how concentrated the calcium carbonate nanoparticles are in a given space over a given time period, which allows them to control nucleation. Until now, these thermodynamic and kinetic factors have remained unknown because real-time observations are difficult to perform on particles so small: The very first size of the calcium carbonate particles forming on quartz are about 8 nanometers, or 8 billionths of a meter, in diameter. Previous research in this area has been performed mainly with molecular modeling, which has been inadequate to reveal the kinetic factors of nucleation. In experiments at Argonne National Laboratory, Jun’s group used small angle X-ray scattering for in situ probing of the nanoparticles. In her lab at Washington University, they used atomic force microscopy for ex situ imaging of calcium carbonate nucleating on quartz.